Claudio’s for the holidays has a good ring to it – especially if you’re looking for a fun place to celebrate this year’s holidays with friends. Claudio’s is an awesome party destination. Claudio’s is also the perfect place for your corporate reception, special occasion, holiday party and/or New Year’s Eve event. 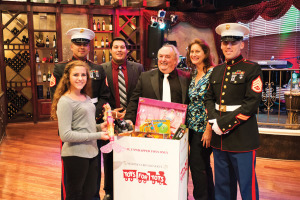 Owner Claudio Sereni, known for his community support, is proud to participate with the U.S. Marines for Toys for Tots program this Holiday Season. On Dec. 11, 2015 at 6 p.m., Claudio’s Restaurant & Piano Bar and Bay Area Houston Magazine will be holding a Christmas celebration benefitting the Toys for Tots. The evening will include complimentary hors d’oeuvres, drink specials, live music, dancing and giveaways, door prizes and holiday cheer. Guests are respectfully requested to bring an unwrapped toy for a young boy or girl. Festivities begin at 6 p.m. An RSVP is must, as space is limited. In 1981, Claudio visited his father in the U.S. and loved it so much, he decided to stay. He worked in Houston in the restaurant business doing a variety of work related to food and music, naturally. In 1989, NASA asked Claudio to perform at a surprise party they were giving for a visiting Italian astronaut. “I saw the lake and the beautiful area, and decided I wanted to move here.” And so he did. At first, Claudio worked in various Bay Area restaurants in management and performing musically. Then, in 1996, he opened his first Piano Bar in Kemah and enjoyed great success. This spring, Claudio opened his new location with a cast of 25 employees, innumerable musicians, and an environment that makes you feel like family. “I want to make people happy and have the best time. They eat, they dance; I am here for them,” says Claudio. Claudio’s has been an entertainment mecca. The talented Abel Salazar performs 6 days a week, Christa and Claudio perform every Friday and Saturday. Also, coming in December is live bands on weekends, guest musicians, as well as Sophia Sereni who also entertains restaurant patrons. Every night there is something different, from both the music and food points of view. 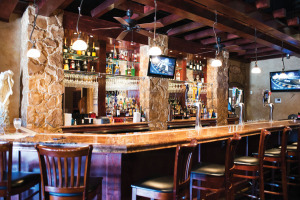 Claudio’s has successfully combined very good food and fine entertainment making it one of the premier entertainment venues in the Houston/Galveston Bay Area. 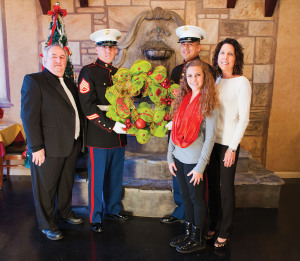 Claudio, his fiancé Summer, his children Sophia and Daniel, and marines SSgt Bushman and Garcia urge you to donate to Toys for Tots this holiday season. Daily, there are new dishes, always taste tested by the staff. And, you can request any custom dish from the talented chefs. You have your choice of homemade pasta. The sauces are made daily. The herbs are fresh. In fact, everything is fresh and the recipes are authentic Italian. Claudio speaks glowingly of his staff. Due to overwhelming demand, Claudio’s is open 11 a.m. – 2 p.m. Tuesday through Friday for lunch. A must is the Sunday Brunch from 11 a.m. – 2 p.m. every Sunday. Claudio has again gone all out for his Annual New Year’s Eve Party. For the modest price of only $80 per person, your evening will include a five-course dinner, a bottle of champagne, party favors, live music, dancing and lots fun and revelry. Space is limited, so make your reservations now. At Claudio’s, you are treated like family. Speaking of family, three of Claudio’s children work there. Daniel is a waiter, Gina hostesses, and Sophia sings. “Music is a family affair,” says Claudio. “Their mother is a pianist and teaches music, so they got it from both sides.” Claudio also has a musician son, Alex, who lives in Austin. His daughter, Jessica, still lives in Italy and has made Claudio a proud grandfather of three. Claudio is presently engaged to a lady named Summer Winter Camp. You can meet her at the restaurant, and perhaps mention that “Summer Sereni” sounds quite lyrical if she chooses to change her name. Claudio’s Restaurant and Piano Bar offers catering and special events featuring a variety of entertainment. Go to their website www.claudiospianobar.com for more information. They are located at 3202 Marina Bay Drive, League City, phone: 281-957-9262.